It's a Song & Dance Show! 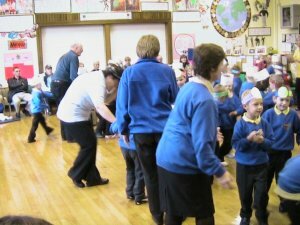 The children of Parkside Infant School have been learning old miners songs and dance routines. On Wednesday 17th November 2004 the had the chance to play to a "sell-out" audience of parents, governors and guests invited from the local community. It proved to be an exceptional event. The parents and teachers were proud, the invited guests were impressed and the children had a great time. Most importantly a lot of people were made aware of our mining heritage by a single event. 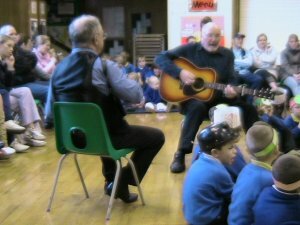 Jon & Jim who had trained the children provided the music and sang along with the children.